﻿The Bee Hive is a complex of Colonial buildings set alongside the Little Elk Creek. Four buildings remain of what was once a bustling community, providing sustenance to the many mills nearby. ECPS purchased the property in 2016. 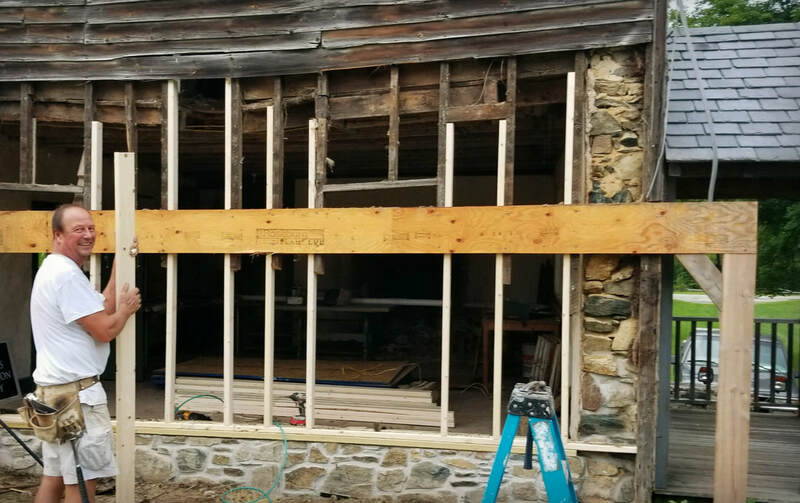 The fireplace in the Fence Maker's House was rebuilt in 2014 and a drop ceiling hiding original exposed beams was removed. The Cooper's Shop was also cleared out and the keystone of the massive fireplace inside was restored to its original position. 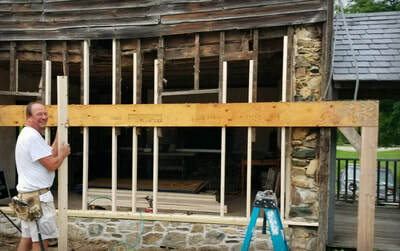 the all wood west wall was never intended to be an exterior wall. It was sheathed with siding when the center buildings were dismantled. The wall was in very bad shape and not salvageable. The brick chimney, a 19th century addition to accommodate a coal or wood stove, was removed by volunteers. The foundation on the west side was rebuilt with stone found entirely on site. The wooden exterior is being replaced in stages and in kind. You can follow updates on the work by liking our pages on facebook: Elk Creeks Preservation Society and The Bee Hive. If you'd like to help with the restoration work there are many ways you can lend a hand. Experienced carpenters are needed, but it would also be wonderful just to have more hands to make the clean up easier. No experience necessary! Also needed are painters, plasterers, and seamstresses. Other ways to be involved: grounds-keeping, research help, organizing fundraisers and events, working at the annual Apple Butter Festival in October, or occasionally providing drinks/snacks/meals for other hard-working volunteers. 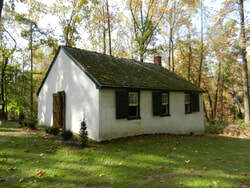 Centre School is the oldest stone schoolhouse standing in Cecil County today. 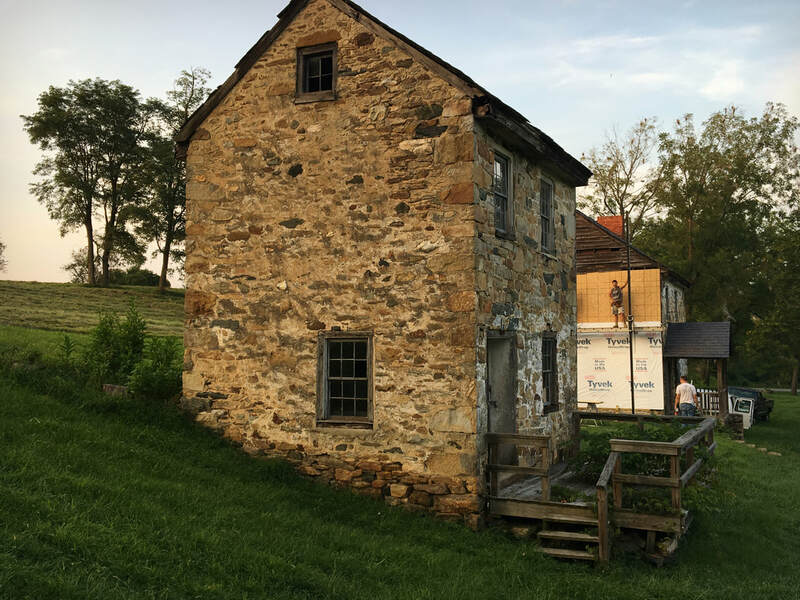 Built in 1849 of fieldstone, the building is located within the Fair Hill Natural Resources Management Area. The school was restored in 1993, with support and funding from Elk Creeks Preservation Society. Careful attention was paid to historic accuracy. 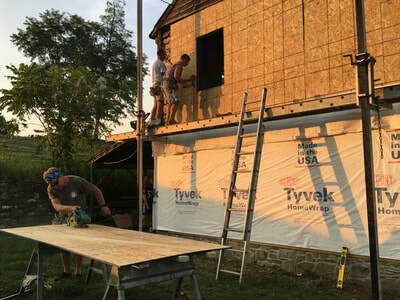 ECPS recently renewed its dedication to this important piece of our history by funding a new cedar shake roof and helping to maintain the building. Working with the Department of Natural Resources, we were able to offer a one-room schoolhouse experience to homeschoolers in grades 3, 4, and 5. We hope to continue this partnership and expand the programs offered.